In 2009-2012 I went into a dentist's office in the United States of America. There were a few touchscreen game systems. One of them had one of the Luxor video games, I think Luxor 2 or Luxor 3. I looked at the names of all the games Wikipedia says the same developer made and found none that seem to be about snowmen. 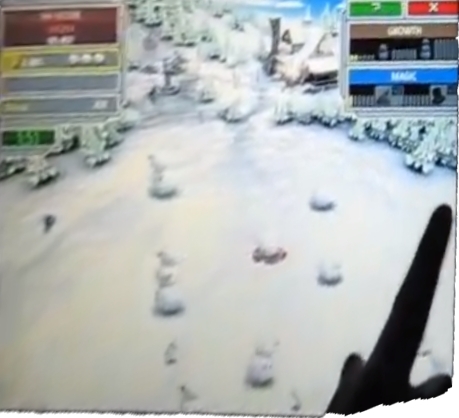 In it, there are a lot of snowmen running around in circles on some sort of icy-looking surface. They were the kind of snowman with a carrot, coal eyes, and a coal mouth, like you see in movies. You can drag snowmen of the same height or smaller onto others to combine them. For example, a snowman made from one snowball could be dragged onto a two snowball snowman to make a three snowball snowman. I think some of them were given hats if they got tall enough. 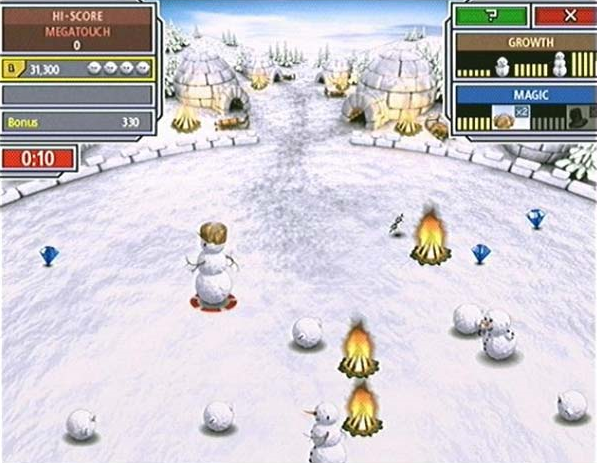 When going between levels, which each had a goal such as "Make 4 three-snowball snowmen", the levels were represented as different snow globes. The snowman could at least get to be four snowballs tall; I didn't beat the game, so it might have gone further. I believe this game was targeted towards kids. User Valorum has found a video of someone playing the game here. As you can see, there's a bar marked "Magic" which would place this strongly on-topic for SFF. Unfortunately, the products that played this game (the Merit Megatouch Countertop Touchscreen range) are now discontinued. You can pick them up on ebay or from specialist retro-gamer retailers but they're not cheap. In Call of Duty: Ghosts, is Riley mind-controlled or given orders? Ender's Game simulator real game? Was the 2006 video game Prey's spirit world based on Cherokee beliefs?